Are you planning to grow out a beard? Well, before you achieve that long or short well-groomed beard that will earn you the admiration of your fellow men and cause little boys to stare at your face with endless fascination, you’ll first need to get through the itchy beard stage. Why is my beard itchy, I hear your cry. Beard itch is annoying, irritating, and one of the main reasons why most men start growing a beard only to quit a couple of weeks later. If you want to be successful in your beard-growing mission, read on to find out why all beards itch as they grow and discover helpful tips that will make battling the itchy beard stage an easier task. 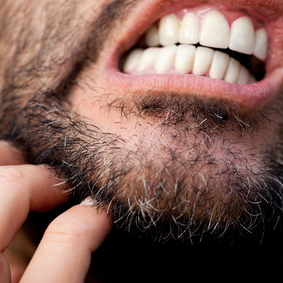 Yes, as crazy as it sounds, shaving your facial hair is actually the main reason why your beard will itch as it grows. This is due to the fact that as you shave, the razor will cut your hairs at an angle that will leave them with a sharp edge. When your facial hair starts growing, these sharp edges poke at your skin as they penetrate to the surface, hence the uncomfortable itch. In some cases, these coarse edges can even cause redness on your skin. Since the sharp edges become dull as your beard grows longer, beard itch brought on as a result of shaving is only temporary. If you suffer from dry skin, you’ll experience a beard that is itchier than that of men who don’t have dry skin. When the skin below your beard is dry, you’ll naturally feel itchy. Combine this with coarse edges and the itch you feel may be quite unbearable. What’s more, if the dryness persists, you’ll continue feeling itchy even when you’ve already achieved a full beard. Some men decide to endure the beard itch stage and wait for it to pass naturally. With this option, your beard itchy stage may persist for longer than necessary and you’ll be uncomfortable throughout. Therefore, it’s more advisable to try out these three effective tips instead. As your beard grows longer, the dead skin cells shed by your face that used to fly away as well as dust particles will start collecting in your beard. An accumulation of these particles in your beard will agitate your skin causing it to itch even more. Therefore, it’s vital that you shampoo and condition your beard to keep it clean. Aside from keeping your beard clean, shampoo and conditioners work to soften the hairs on your face thus making them less of an irritant to the skin. Make sure to use mild or organic shampoos and conditioners that do not clog skin pores or dry out the skin. You can also use shampoos and conditioners specially designed for beards. Keeping your beard and the skin underneath it clean is not enough to ease itchiness; you’ll also need to moisturize your beard. Moisturizing your beard helps to hydrate your skin and soften your beard hairs thus getting rid of the itch. The market is filled with beard moisturizing products, therefore choose wisely and go for a product that agrees with your skin. Some moisturizing products such as beard oil double up as styling agents that will help you keep your beard neat and lustrous. The best time to apply your beard moisturizer is after washing your beard. This way, both your hair follicles and skin pores will be able to easily absorb the moisturizer. If you want your moisturizing products to work, it’s vital that you avoid washing your face with hot water. Hot water tends to dry your skin and also makes it makes it difficult for the oils in your moisturizer to stay on the skin. Therefore, wash you face with cold water as it gives you a fresh kick and enhances the effectiveness of your beard moisturizer. If you cannot stand cold water, try using lukewarm water. Although beard itch is an unavoidable first phase of beard growing, the good news is that it’s only temporary. If you follow the above tips to relieve beard itch, the itchiness will fade away in 1 to 3 weeks’ time. And once you get through the itching stage, the other phases of your beard growing, which include trimming, upkeep, and styling, will be smooth sailing.